Though it is supported by major retailers attempting to work around the credit card swipe fees charged by banks and card issuers, CurrentC may be hindered by a complicated user interface and security concerns as detailed in a report by TechCrunch. 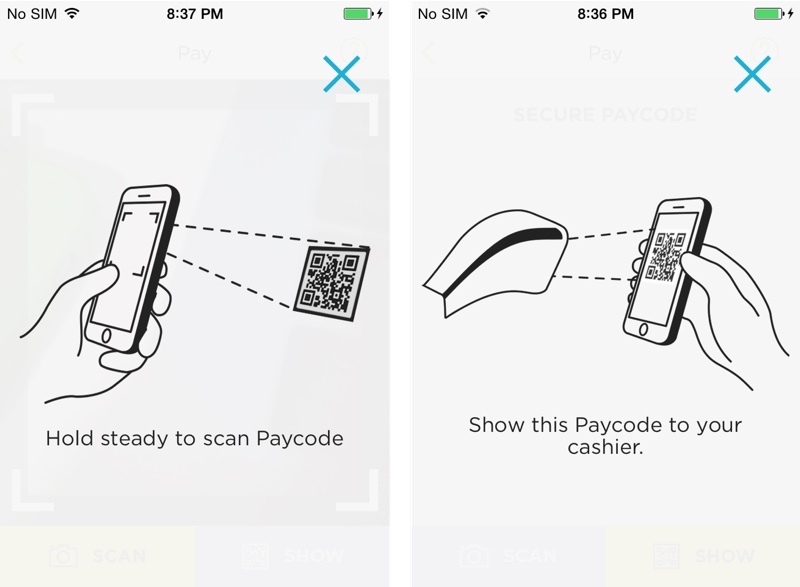 Unlike Apple Pay, which uses NFC to process payment wirelessly, the CurrentC system uses a dedicated app and relies on QR code scanning to process a consumer's payment. The app stores receipts as well as provide access to loyalty accounts, which can be used to apply discounts at participating retailers. To use CurrentC, consumers must have an active account that requires them to set up a bank account as a payment source and confirm their identity by providing their driver's license and social security number. This sensitive information is stored in the cloud and not on the phone. When you sign up for CurrentC, you’re supposed to add your bank account. This lets CurrentC process payments for you without retailers having to pay the steep credit card processing fee. You can also add retailers’ loyalty credit cards or gift cards as payment methods. Payments are pulled automatically from the bank account linked to the user's account via Automated Clearing House (ACH) transactions, a system adopted as a way to help merchants avoid paying the approximately 2-3 percent fee levied by credit card companies. MCX also provides retailers with consumer intelligence information, allowing them to send targeted ads and discount offers to consumers based on their purchase history. CurrentC notes it may share info with your device maker, app store, or developer tool makers. Oddly, it will collect health data. Precise location information is used to verify you’re at the retailer where you’re making a transaction, and if you opt in it can be used for marketing or advertising. CurrentC notes that you can opt in to be able to capture and store photos in the app for a hypothetical visual shopping list or other features down the road. In 2012, MCX reportedly ramped up its efforts to entice retailers to join its mobile payments system., asking participating merchants for an upfront fee of up to $500,000 and requiring them to sign three-year exclusivity deals. These deals appear to be the reason Rite Aid and CVS disabled unofficial access to Apple Pay in their stores, although it is unclear why they waited until after the service went live and customers were using it before disabling their systems. CurrentC is currently in beta testing and on target for a 2015 launch, which positions it behind Apple's already existing Apple Pay system. It is reportedly being pilot tested in Minnesota at select retailers before rolling out nationwide next year. Because the payments do not require NFC or Bluetooth LE, the system will be compatible with a variety of Android and older model iPhones. Adoption may be slow as retailers must modify their point of sales systems to accept these payments. Consumers may also balk at a system that requires the cloud storage of sensitive information and a cumbersome checkout process that relies on QR codes accessed through a separate app and tied to direct bank withdrawals. To compensate for these detractors, MCX reportedly will push retailer discounts and loyalty purchases to entice consumers to adopt this upcoming mobile payments system. This antiquated technology will be dead on arrival. You want people's drivers license, social security number and bank account number? I can't wait to get ads about erectile dysfunction on my Facebook page after having bought shampoo at CVS using a QR code scanner. Who ever came up with this should be fired. How is this any easier then paying with cash or card? What an awful idea. This will crash and burn soon enough - nobody wants to be scanning QR codes when their devices support NFC. It's not. It just saves the retailers 2% on transaction fees. They forgot to provide any incentive for customers to use it. Actually, by storing sensitive info in the cloud, they've provided a disincentive. Exactly. At least from the information I've seen there is ZERO benefit for the consumer. It only benefits the retailer. Also collecting health data WTF? Providing a vendor with a credit card number for them to store is one thing. My bank account information is a whole different level of scary. They are moving the opposite direction of what I want so that they can make more money. No Thank You. Wow, $500K up-front fee and a three-year lockdown? That's forever in technology terms (like a two-year contract on a smartphone), and anything can change in a heartbeat (read: Apple Pay). If I was a retailer, I would've dealt with the rolling transaction fees. Looks like a bunch of retailers each wasted half a mil, and CurrentC will be dead on arrival, but not without giving their execs a bunch of golden parachutes on the way down. Typical corporate mentality.